Today, some cultures view the consumption of dog meat to be a part of their cuisine, while others consider consumption of dog to be a taboo. Some people, especially from East Asia and Southeast Asia support the idea of dog meat. Proponents of dog meat have argued that placing a distinction between livestock and dogs is western hypocrisy, and that there is no difference with eating the meat of different animals. For example, in China, local economy revolved around agriculture in ancient times. Dogs didn't play a big role like Europe. On the contrary, every ancient Chinese government instituted some protective policies for farm cattle, even illegal to be slaughtered in some cases. In this way, some Chinese think Westerners are pressing their own values on them. Dogs are not born to be companion friends for them. Some people, especially from Western countries oppose dog meat. They view dogs as man's best friend. Organizations such as World Animal Protection have been increasingly directed against dog meat consumption and the treatment of dogs caged and farmed for their meat. Dog meat (Chinese: 狗肉; pinyin: gǒu ròu) has been a source of food in some areas of China from around 500 BC, and possibly even earlier. Researchers in the Royal Institute of Technology theorized that wolves in southern China may have been domesticated as a source of meat. Mencius, the philosopher, talked about dog meat as being an edible, dietary meat. Dog meat is sometimes called "fragrant meat" (香肉 xiāng ròu) or "mutton of the earth" (地羊 dì yáng) in Mandarin Chinese and "3–6 fragrant meat" (Chinese: 三六香肉; Cantonese Yale: sàam luhk hèung yuhk) in Cantonese (3 plus 6 is 9 and the words "nine" and "dog" have close pronunciation. In Mandarin, "nine" and "dog" are pronounced differently). While remnants of this tradition remain in certain quarters of Chinese society, the degree to which it is deemed to be socially acceptable has now become contested, with Chinese animal groups and pet-owners increasingly speaking out against the practice. Controversy has centered particularly on the cruel and inhumane treatment of dogs prior to their slaughter, with allegations having surfaced that these animals can at times be skinned while still alive and there is photographic evidence they are even boiled alive. Most notably, a series of events that occurred in various parts of the country in 2012 have raised further awareness on this issue in the mainland, with local and international news media having reported on how Chinese netizens and the Chinese police had been intercepting trucks transporting caged dogs to be slaughtered in such localities as Chongqing and Kunming. According to Apple Daily June 21, 2013 report, in Yulin, Guangxi the locals were celebrating the "lychee dog meat festival" on the same day and they would slaughter more than 100,000 dogs. A follow up also by Apple Daily on June 22, 2013, showed that there are some demonstrators, claiming that the demonstrators were blamed for attacking the locals. Some Chinese people spent their money to rescue the dogs, and found rescued dogs either pregnant or with new-born puppies. They also found ill dogs. 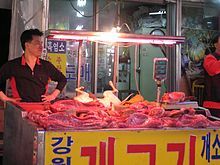 Although a fair number of South Koreans (perhaps 30 to 60%) have eaten dog meat at least once in their lifetime, only a small percentage of the population (perhaps 2%) eats it regularly. There is a large and vocal group of Korean people that are against the practice of eating dog meat. There is also a large population of people in South Korea that do not eat or enjoy the meat, but do feel strongly that it is the right of others to do so. There is a smaller but still vocal group of pro-dog cuisine people in South Korea who want to popularize the consumption of dog in Korea and the rest of the world, considering it to be part of the traditional culture of Korea with a long history worth preserving. The restaurants that sell dog meat do so, often exclusively, at the risk losing their restaurant licenses. A case of a dog meat wholesaler brought up on charges of selling dog meat in arose in 1997. However, an appeals court acquitted the dog meat wholesaler, ruling that dogs were socially accepted as food. According to the National Assembly of South Korea, more than 20,000 restaurants, including the 6484 registered restaurants, served soups made from dog meat in Korea in 1998. In 1999 the BBC reported that 8,500 tons of dog meat were consumed annually, with another 93,600 tons used to produce a medicinal tonic called gaesoju (개소주). As of 2007[update], the dogs were no longer being beaten to death as they had been in past times. Dog meat is consumed more commonly in the northern part of Vietnam than in the south, and can be found in special restaurants which specifically serve this type of meat. Dog meat is believed to bring good fortune in Vietnam. It is seen as being comparable in consumption to chicken or pork. In any urban areas, there are always sections which house a lot of dog-meat restaurants. For example, on Nhat Tan Street, Tây Hồ District, Hanoi, many restaurants serve dog meat. Groups of customers, usually male, seated on mats, will spend their evenings sharing plates of dog meat and drinking alcohol. 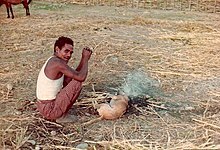 The consumption of dog meat can be part of a ritual usually occurring toward the end of the lunar month for reasons of astrology and luck. Restaurants which mainly exist to serve dog meat may only open for the last half of the lunar month. 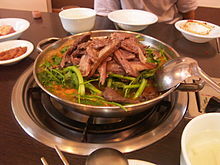 Dog meat is also believed to raise the libido in men. The Associated Press reported in October 2009 that a soaring economy has led to the booming of dog restaurants in Hanoi, and that this has led to a proliferation of dognappers. Reportedly, a 20 kilograms (44 lb) dog can sell for more than $100—roughly the monthly salary of an average Vietnamese worker. The production of food from dog meat for commercial purposes such as selling, is illegal in Switzerland, however, farmers are allowed to slaughter dog and cats for personal consumption. ^ Anthony L. Podberscek (2009). "Good to Pet and Eat: The Keeping and Consuming of Dogs and Cats in South Korea" (PDF). Journal of Social Issues. 65 (3): 615–632. doi:10.1111/j.1540-4560.2009.01616.x. Dog meat is eaten nationwide and all year round, although it is most commonly eaten during summer, especially on the (supposedly) three hottest days. ^ a b Douglas Mawson. "The Home of the Blizzard". ^ William Saletan (January 16, 2002). "Wok The Dog – What's wrong with eating man's best friend?". slate.com. Retrieved 2007-07-23. ^ Ahmed Zihni (2004). "Dog Meat Dilemma". sunysb.edu. Archived from the original on 2007-08-11. Retrieved 2008-05-11. ^ "'Do Koreans eat dogs?' and Western hypocrisy". ^ John Feffer (June 2, 2002). 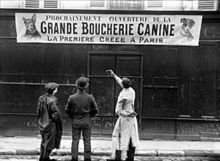 "The Politics of Dog – When globalization and culinary practice clash". Archived from the original on 2006-04-27. Retrieved 2007-05-11. ^ Murray, Senan (2007-03-06). "Dog's dinners prove popular in Nigeria". BBC News. Retrieved 2006-03-06. ^ Willy Volk (March 7, 2007). ""Man Bites Dog": Dining on Dog Meat in Nigeria". gadling.com. ^ Isaac Shobayo. "EBOLA: Jos residents shun bush meat, stick to dog meat". tribune.com.ng. ^ "Morocco in grip of DOG MEAT scandal after police find carcasses of pets destined for restaurants". Mail Online. ^ About THE XOLOITZCUINTLE (archived from the original on 2012-07-19), Xolo Rescue USA (archived from the original on 2012-07-14). ^ "Donner Party Ate Family Dog, Maybe Not People : Discovery News". News.discovery.com. 2010-04-15. Retrieved 2012-10-24. ^ "A new cure for consumption is being tried in Shelbyville, Ind. It is an exclusive diet of dog meat". A Florence Bank in Trouble - Telegraphic Brevities. The New York Times. 1891. ^ "PATRONS OF DOG MEAT". The New York Times. 1885. ^ "A Family Living On Dog Meat". The New York Times. March 12, 1876. ^ "Miners eat horses and dogs". The New York Times. 1904. ^ Roald Amundsen. "The South Pole". ^ Wade, Nicholas (7 September 2009). "In Taming Dogs, Humans May Have Sought a Meal". New York Times. Retrieved 3 January 2012. ^ "How many cats & dogs are eaten in Asia? AP 9.03". animalpeoplenews.org. ^ "Pets snatched and butchered for food - Global Times". globaltimes.cn. ^ "Guangzhou bans eating snakes—ban helps cats". Retrieved 2008-02-16. ^ "Tasteless? Food festival in Yulin, China celebrates canine culinary culture – with 15,000 dogs on the menu | Mail Online". London: Dailymail.co.uk. 2011-06-28. Retrieved 2011-06-30. ^ "Salon Editorial: An Olympic Disgrace". ^ "'Tech-savvy citizen rescues 500 dogs from becoming dinner'". Retrieved 26 April 2012. ^ "'April 20th 500 caged dogs rescued in Kunming China'". Retrieved 20 April 2012. ^ Gerges, David (2012-01-18). "'Truck full of dogs crammed into tiny cages and bound for Chinese restaurants is intercepted by animal lovers'". Daily Mail. London. Retrieved 19 January 2012. ^ "走進狗地獄 饞嘴埋沒人性 - 蘋果日報 - 兩岸國際 - 20130622". Apple Daily 蘋果日報. ^ Cheng, Jonathan (2006-12-23). "Dog-for-food butchers jailed (DUBIOUS first case)". The Standard – China's Business Newspaper. Retrieved 2007-01-10. ^ "First Case Imprisonment in HK for Dog Meal". 2006-05-29. Retrieved 2006-12-23. ^ "Activists expose dog meat trade". Taipei Times. 2011-06-23. Retrieved 2011-06-30. ^ "Tribal Naga Dog meat delicacy". Retrieved 29 January 2012. ^ "Minahasa" (PDF). Retrieved 2006-12-20. ^ Nihon Shoki Chapter 29 – Kanbun: 亦四月朔以後。九月三十日以前。莫置比満沙伎理梁。且莫食牛・馬・犬・猿・鶏之完。以外不在禁例。 English: Also, from the first day of the first[sic. it should read fourth] month until the 30th day of the ninth month, it is prohibited to use hinasakiri or fish traps. Also, cow, horse, dog, monkey, and chicken meat is not to be eaten. Meats outside of these are not prohibited. ^ Hanley, Susan B. (1999). Everyday things in premodern Japan: the hidden legacy of material culture. University of California Press. p. 66. ISBN 0-520-21812-4. ^ (ญี่ปุ่น) 平成20年動物検疫年報仕出地域別輸入検疫状況, Quarantine Statics, The Animal Quarantine Service, Ministry of Agriculture, Forestry and Fisheries (Japan). ^ "Statistics on the Dog Meat Industry". Korea Animal Rights Advocates. Percentage of Population Eating Dog Meat. ^ "The South Korean Dog Meat Trade". Animal Welfare Institute. ^ Kim, Rakhyun E. (2008). "Dog Meat in Korea: A Socio-Legal Challenge" (PDF). Animal Law Review. 14 (2): 231. ^ Podberscek, Anthony L. (2009). "Good to Pet and Eat: The Keeping and Consuming of Dogs and Cats in South Korea" (PDF). Journal of Social Issues. 65 (3): 615–632. doi:10.1111/j.1540-4560.2009.01616.x. ^ Hopkins, Jerry; Bourdain, Anthony; Freeman, Michael (2004). Extreme Cuisine: The Weird & Wonderful Foods That People Eat. Tuttle Publishing. p. 23. ISBN 0-7946-0255-X. ^ Kim, Rakhyun E. (2008). "Dog Meat in Korea: A Socio-Legal Challenge" (PDF). Animal Law Review. 14 (2): 202. ^ "Metro Manila Commission Ordinance 82-05". Archived from the original on 2005-12-05. ^ Desiree Caluza (2006-01-17). "Dog meat eating doesn't hound Cordillera natives". Philippine Daily Inquirer. Archived from the original on 2006-02-19. Retrieved 2006-10-27. ^ Titcomb, M. (1969). Dog and Man in the Ancient Pacific. Honolulu: Bernice P. Bishop Museum Special Publication 59. ISBN 0-910240-10-8. ^ Ellis, W. (1839). Polynesian Researches. 4. London: Fisher, Jackson. ISBN 1-4325-4966-9. ^ Mumford, David (1971). The Explorations of Captain James Cook in the Pacific. New York: Dover Publications. ISBN 0-486-22766-9. ^ "'Vietnam Demand for Dog Meat Keeps Thai Dog Trade Alive'". Very Vietnam. Retrieved 4 September 2011. ^ "'Thai authorities seize 800 dogs destined for Indochina meat trade'". Pattaya Daily News. Retrieved 15 January 2012. ^ "'Business booming for the dog smugglers of the Mekong'". CNN. 2012-01-25. Retrieved 24 January 2012. ^ "'The rise of the dog snatchers'". The Bangkok Post. Retrieved 4 September 2011. ^ "'You Can Help Stop the Slaughter...'". The Soi Dog Foundation. Archived from the original on 2013-01-21. Retrieved 30 August 2012. ^ "Democratic Republic of East Timor" (PDF). worldconflictstoday.com. p. 3. ^ "Uzbekistan news report on dog restaurants". Uznews.net. Retrieved 2012-10-24. ^ "Cholera, bird flu present, but VN still A/H1N1-free". Vietnamnet. Retrieved 2009-05-15. Retrieved from Internet Archive 12 January 2014. ^ "Museum of London Blog The curious case of the dog in the... » Museum of London Blog". Museum of London Blog. ^ "We found the meat shops all closed, ... with three exceptions, namely; shops that have recently and openly sold dog meat.... The average price were 12 francs a kilo, bones and all, (about $1.30 a pound) and some meat that had been obtained by special exertions for the soup kitchens." "Meat Shops Closed As Belgians Go Hungry". The New York Times. July 23, 1916. ^ "The Council of the Veterinary School of Belgium even recommended dog meat for human food after being properly inspected". Eating The Old Mare. The New York Times. October 8, 1888. ^ "Use Horse and Dog Meat – Germans forced to that diet by high price of other meat". The New York Times. 1900. ^ "...the German breeders... heightened the price to such an extent that horse, and even dog's meat, has become staple with the poorer classes in certain districts, and notably in the large cities". American Food In Germany. The New York Times. 1898. ^ "NETHERLANDERS SEEK SUNDAY MEAT IN VAIN; Food Situation Becomes Acute as Nazis Seize Dog Sausage". New York Times. 1940-12-08. Retrieved February 15, 2014. ^ a b Day, Matthew (2009-08-07). ""Polish couple accused of making dog meat delicacy", ''Telegraph''". London: Telegraph.co.uk. Retrieved 2012-10-24. Kim, Rakhyun E. (2008). "Dog Meat in Korea: A Socio-Legal Challenge". Animal Law. 14 (2): 201–236. SSRN 1325574  . This page was last edited 22:04, 31 March 2015 by Wikipedia user Jdforrester (WMF). Based on work by Wikipedia anonymous users imported>Vsmith and imported>AnomieBOT.